Sign-Age is happy to assist our clients in complying to the signage requirements of the Americans with Disabilities Act. Essentially, ADA ensures that those with special needs have access to public places. We’ve studied the law and have determined that, in certain instances, signs alone can bring you closer to compliance. Other times the law may require modifications to your physical plant. 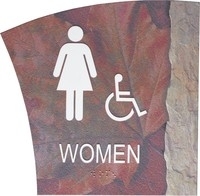 Let us assist you with your ADA signage needs! Sign-Age begins the process by working with you to establish the best solution for your signage needs. Our staff of experts are dedicated to providing you, your company or your organization with the most effective solution to accommodate your specific requirements and provide the best products in the industry. If an on-site survey or analysis is necessary, one of our visual communications consultants will be happy to set an appointment at your convenience.